Multiple mounting options let you put this versatile shop light where you need it most. With two bases — one magnetic, one clamping — this affordable lamp mounts just about anywhere to enhance shop lighting. Great for drill presses, band saws, workbenches and more. Flexible arm measures 24". Uses standard light bulbs (100Wmax) or use a compact fluorescent bulb to save energy and reduce heat. A lot of people complained that the light drooped / would not stay in set position. I have had no problem with it holding position. Several mentioned the magnet is very strong. That is correct. I searched for a 24" light with a great magnet. it works on both perfectly, and the price was fair. I like the light it has a strong magnetic base or a clamp base so you can use the light any where. I use it for my lathe and band saw. I also like that I can direct the light where I need it. I have one of these on either side of the work bench. Both position well and with LED 14 W bulbs are perfect for keeping things nice and bright while I work. The work bench is used primarily for photography equipment. Rockler Shop snake light meets my expectations. This Light is just what I need for my work bench. At some point, I'll likely get one to illuminate my computer keyboard. The magnet is strong and the neck seems strong. 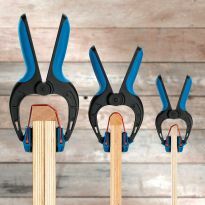 Gives Rockler a good name. Very well built. I like. Makes fixed bendable light hit right on the blade or any other spot you don't want hiding. designed and built. I have struggled for years with flimsy articulated desk lamps that are not designed or built to be constantly moved and soon fail. This lamp is sturdy, well designed for the purpose and well built. I may get another one for my table saw! Works really well. Just what I needed. You're not forced to use the harsh light of an LED lamp. Use whatever lamp type you like. The magnetic base is more than strong enough. However, sheet metal does not have enough ferrite mass to support the lamp. This works great on the pillar of a milling machine or any metal horizontal surface. Attach to thicker metal. If the gooseneck is twisting then check the fastening nut on the base. Pull back on the outer plastic sleeve and tighten. Also, twist the gooseneck cable counter-clockwise to tighten the metal coil. You may have to do this periodically depending on how much you need to keep adjusting the lamp. Yes, I will purchase another. Made in Taiwan and is of good quality. I purchased this lamp for my new band saw. The magnetic base holds it tight and the long flexible arm lets me put light where I want it. I put one on my bandsaw and on my drill press and what an improvement. The long neck bets the light right where you want it and the magnetic base held easily. I only put 40 watts in them as the light is concentrated where I need . I would highly recommend these for shops. Very strong magnet, nice long cord, and bright light with easy to use arm. 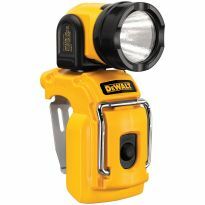 This is a great light that you can take anyware with you. The magnetic is very strong and will stick to anything metal without moving. Gives off enough light to help blind people like me see what I'm working on.You can't go wrong. Probably the sturdiest, best built 'goose' neck light I have seen. The magnet is almost scarry strong, ( needed to slide it off the surface instead of pry it off ) so no worry about it holding. The optional supplied clamp base is equally heavy duty. I noticed no UL or similar approval but I with the quality electrical components including a grounding three wire cord it would easily pass. 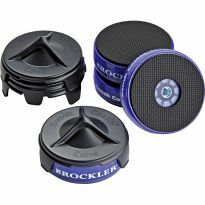 This has a strong magnet and holds on during any vibration . With a new LED bulb, it is perfect fit on the lathe. I have two of these lamps on my lathe. One on the back of the tail stock using the magnet and one on my headstock using the clamp. Absolutely no problems with positioning. They stay where you put them and do not droop. I use 1500 lumen LED bulbs which outshines the competition by far. Highly recommend this especially for wood lathe work. Extremely versatile. Great for illuminating detail work. Just what I needed. The clamp base allows attaching it just about anywhere. The magnetic base secures it to my drill press or other steel item. The flexible snake arm is rigid enough to keep the light pointed exactly where I aim it. 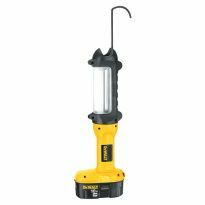 If you need to illuminate a small area for detail drilling, carving, chiseling, etc. this is the light to have. It supplies light where you need it. The neck stays where positioned, the magnetic is very strong however I switched to the clamp screw so I didn't need to reposition the base. I use it with the magnetic base on my Jet 1642 lathe on the headstock. It puts out a great amount of directional light and is easily directed to where I want it. And the arm stays put! It also works well with the clamp base. I put the clamp where I need it on a table or bench and sit the magnetic lamp on that base, no switching out of the base needed. So it can work on any sort of table. I love this lamp! I purchased 2 of these 24"flexible arm work lights for my workshop. They are exactly what I needed and work great! I do scroll saw work and wood carving. I would recommend this light! I put a bright LED bulb in it. I use the magnet base on the side of my lathe. It really helps. The light stays where you put it, and I can shine it down the inside of my hollow forms or bowls. The LED bulb isn't hot if I hit it with my elbow. Highly recommended. I've been very happy, mounted to my lathe bed, stays put and doesn't droop. I use this light on my lathe. I can aim light where I want it and the magnet holds well. I am very satisfied. Very Nice, great magnet, puts light where you need it! I use this on my band saw because the one it came with is not long enough to light where I need it. It only had a 12" flex, which was not long enough, but this one has 24". This light really did the trick. The light is well constructed and is a good value. I use the light mounted by its magnetic base on a mobile 60"x30" metal packing table which has a bench top metal lathe, grinder, band saw, and carving station at each of corners. The 24" height and flexible neck works well with these machines and provides ample light to each machine with minimal adjustments. Suggest installing a LED bulb rather using a CFL or incandescent bulb. The toggle switch is a nice feature. The magnetic base holds quite well. I like having the dual mounting options. I moved the first of these lights to use on my band saw and bought another to replace it as one of several sources of light I have for my workbench. 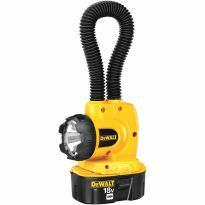 It is an excellent light and an excellent value. The only thing lacking on my Jet Pro band saw was a light. I ordered one of these snake lights and it looks like it was original equipment. I found that by doing a partial twist and then positioning the beam it holds its position very well, and illuminates the work very well. I find the arm of the lamp to be plenty stiff. If you put it in a certain position, it isn't going to move. The toggle switch seems nice and solid. The desk mount bracket is nice and beefy. Seems to be well build in every respect. I haven't tried the magnetic base yet. You can safely ignore the reviewers who didn't like the magnetic base (or thought it was burdensome to have to turn four screws to change bases!). This is the best shop light I have found, and a bargain at the price. The magnetic base is very strong. The clamp base is heavy metal. The gooseneck stays where you put it. The switch is even the right kind--it toggles rather than rotating (those always wear out or break). I bought two and am about to buy two more. I was reluctant to purchase this product due to a previous review questioning the holding capacity of the magnet. I have just installed my light and find the holding capacity to be very good and much better than the more expensive Moffitt light which I also use with a lathe as I do this one. Perhaps the magnet has been made stronger. The only suggestion I could make which might improve the product is to have a bulb shield, but the bottom line for me is that it is a great buy compared to other similar products. Only one on the market. it works well for my application. using a heavy LED Blacklight in it for print inspection. Nice to have a choice of bases: magnetic or clamp. Magnet is strong. I'd like the arm to be a bit less flexible so that it stays in position no matter how the base is oriented. I have it so that the arm points horizontally and the lamp won't stay in position. I need to be able to move it often and position the light in many different positions at my lathe. I'm going to re-mount it so that the arm points vertically and see if that stil gives me the positioning flexibility that I need. Received the light in a timely manor. Have been using with my drill press, very happy with it. Like the fact that you have option to use a magnet or screw down base. This light solves my lighting problems. I use a 4" electric box cover mounted to whatever surface I need for the magnetic base. The only negative is the "snake Arm" has trouble staying positioned when used with a LED light bulb because of the added weight. I like it, I only have just started using it but I think it will do all I ask of it and more. I think in the coming months it will be very useful , I'm glad I got it. Your replacement for a defective snake arm light arrived quickly and works fine I.e. It keeps its head up. So does Rockler. Found the light to be all that I expected. Magnetic base is fine have not usd clamp base yet. Very helpful in use on my lathe. The Snake Arm Shop Light is a very useful tool. In my case, it has been quite helpful in setting accurate bit settings on the router table and monitoring closely my work on the lathe. It is well designed and constructed from good materials. I expect to get many years of use from it. The only reason I did not give the shop light a rating of &quot;5&quot; is the design of the base mount. Two bases are provided: a base with an integral magnet for mounting the light to a metallic table top or cabinet side and a nonmagnetic base that can be clamped to an edge. To change from one base to the other requires removing four screws, taking one base off, attaching the other base, and then reinstalling the screws. I wish there was a quicker way to shift from one base to the other since the best method of mounting often varies from one task to another. I purchased this to attach to the back of my bandsaw so the light would come from my right front as I feed wood into the saw. My saw is well set up and has very little vibration but still there is enough to prevent the magnet from remaining stationary. I beefed it up with a serious rare earth magnet and problem solved. The snake arm is too flexible and "loosey goosey". It doesn't stay aimed in the perfect position and fights you when you try to position it. I was hoping for better. Other than that, it is well made and sturdy, with a decently long cord. Lighting is good, however, the magnet is not very strong. I had to rig it for my application. I would recommend at a lower price. I don't think it's worth the almost $50.00 I paid. I like the light for the way it mounts and the amount of light it puts out. The main problem l am having is that the light end is so heavy that it will not stay where I put it. The magnet holds well and stays stationary on my band saw. The snake arm turns in its holder which causes the light to creep and get in the way. I was disappointed to find that the magnet is not strong enough to support itself on the side of my bandsaw. I bought this specifically for my bandsaw. I have put it on top of the saw and angled the neck down and it gives decent light, but the light is not as strong or direct as it would be if the magnet would stick sideways to the the saw. The neck on my light seems to hold in place well, unlike what others have said. They work extremely well. I own three. Always need good light in a shop. Looks like a very nice option. Have one need another. Great Lamp. Thank You. we use it as a machine light for multiple types of machines. My son wanted this for Christmas. To add light to my scroll saw. The ability to easily move the light to different machines will be helpful! Have looked all overÂ for these. Hard to find in the real world. Seemed to have a more quality clamp than the others I have seen. Using for bench top lighting. This product did not work and was returned. The light was too heavy to remain in some positions. For use in workshop on our drill press. Nice light, using it on my bandsaw. Use this at my model building bench. Use a 100 watt equivalent LED bulb, takes up no space on the bench. Appears to be a good value and is a product for which I have been shopping. I have multiple uses for this light in my shop. Use in dark workshop for drill press and other projects. Excellent quality and functionality. Use one lamp in my shop bench and one for my office desk. Love it. To see my lathe work. I need a new work light. Magnet base for the drill press. I hope the magnet is strong enough for the weight of the lamp. My bandsaw did not come with a light. Because of the dual mounts, I can use this with my lathe and/or with my workbench. I have three of these but one has broke and i need to replace it. I have a few others of the same and they work very well. A great light for my scroll saw and drill press. I wanted a non led light for a particular tool set up. to add to my lathe to see into the bowls and outside profile cuts, works great with LED bulb and long cord is a plus. Magnet is strong and will not walk from vibration. I purchased two of these a while back for either side of my radial-arm saw, you can position the lights to shine in at a 45-degree angle, thereby eliminating the shadow of the saw's support arm. They worked great, so I bought two more for my band saw and lathe. I had purchased one before and like it ease of use. BEST ANSWER: This light is not approved for outdoor use. However, as long as it is fully sheltered from any moisture it should be ok. I use mine in my shop/garage just fine. so how much outdoors is the question. No. It is not outdoor rated since there are vent holes in the top. How long is the plug in cord ? BEST ANSWER: The plug in cord is about 6 ft long. The cord on my lamp is 60 inches. Is the shade made of metal or plastic? BEST ANSWER: Metal. All metal except plastic covering over the flexible arm. Good quality. It is made of metal. It is a really nice/sturdy light. I ned to know the diameter of the round magnetic base on Rocklers 24'' Snake Arm Shop Light...item 20174 to see if it will fit my application? BEST ANSWER: Yes, if the weather permits. I would not use this light outdoors. It has vent holes around the switch which could let in rain.